How Many Pistol Pass Plays Did He Say? 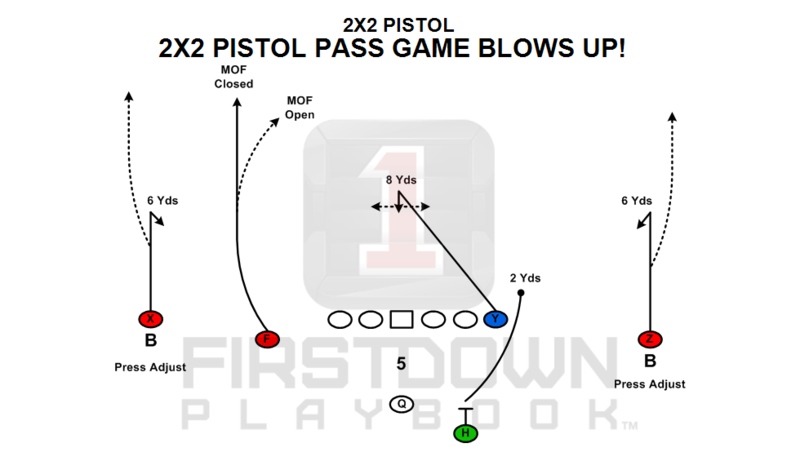 When you go to the FirstDown PlayBook DropBack pass game section today it will be a little bit like “Oh wow, what are they doing?” The little green buttons that indicate a new play are on around a hundred plays in the 2×2 Pistol section alone. Well even though we would like to say we have been on a play drawing binge it’s not quite that extreme. Yes, there are over one hundred new pass plays in the FirstDown PlayBook pass game section but many of them are Pistol plays that have been converted over from Gun or where the quarterback was under center. When we launch the editing tool in 2018 this will obviously solve a lot of this work because you can just put the QB and the running back where you want them on any of our thousands of pass plays. For right now though, we realize that many of you are using this section in 2017 and you would like to have a drawing that has the QB in all of the three normal positions. So when you take a peek today don’t be shocked by all of the green “New” buttons. Just know it’s a good thing that is going to help make your passing game a great thing!